Are You A 5-Star Attorney? When making any sort of purchasing decision, customers are typically drawn to reviews to determine what product is the best, or best suited to their needs, before making a final choice. While your law firm does not have a physical product to promote, the idea that reviews can help to sway customer decision making is no different. In fact, according to a recent study, 83% of potential clients begin the process of finding a lawyer by analyzing their reviews. In addition to that, 70% of clients say that they are willing to drive to an inconvenient location to work with an attorney who has better reviews than an attorney who is closer to home. That means that if you are not working to build your credibility through online review generation, then you are potentially missing out on 83% of your target market, as well as an additional 70% of potential clients who may be just outside your targeted geographic market. To put it bluntly, this is a BIG DEAL, and it should be a primary focus of your firm to obtain a favorable review from each client that you work with. Building your online testimonials is not only one of the most important things you can do to promote your Law Firm online, it is also one of the quickest and easiest! Start With Past Happy Clients: The first place to start your review generation is with clients that you have worked with in the past who have had a good experience. Choose your best cases and happiest clients, and reach out to them first. 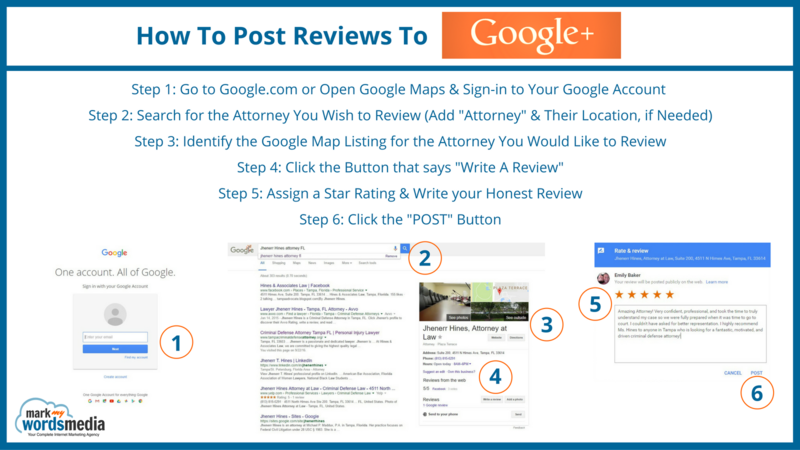 Utilize Existing Online Reviews: If you already have existing reviews that have been posted in places such as AVVO, Google+, Lawyers.com, or Yelp, then these reviews can be consolidated onto your own website. Put A Follow-Up Process in Place: If you do not already have a process in place for acquiring new reviews, then this is what you will need to do next. We can provide you with templates for emails, your review links, and even recommend an automation software to help you make the process as simple as possible. Add a Link to Your Email Signature: This is an easy, passive way to collect reviews. Simply add a link to your firm’s Google+ or Google Maps page in your email signature. This way, whenever there is an opportunity to request a review, you can simply tell the person that the link to post a review is on every email they have received from you, or you can easily send it to them anytime. If you need help determining what link to use, just ask. We can provide you with a link that will take potential reviewers to the right place. Timing is Everything: When you ask for a review is just as important as how. The best time to request a review is right after their case has been resolved. This is when a client is most likely to submit a glowing review of your services. They don’t have to try to recall events, as everything is still fresh in their mind, and they are experiencing positive emotions based on your work that will be reflected in the review that they leave. New Firm Without Clients? You can still generate reviews! Peers and those who are affiliated with you in other aspects of your life can provide reviews to help jumpstart your new legal practice. These may be reviews from past employers, community members, or other attorneys who can honestly speak to your ability to perform for your clients, or to your general character. Where Should Clients Post Reviews? The best place for a client to post a review of your business is on a website other than your own. While this seems counter-intuitive, the reason for this is that while we are able to pull reviews published to other locations to your site, we are not able to push reviews from your site to other review locations. If a review is posted on AVVO, great, we can go and snag it and add it to your site. However, we do not have the ability to add reviews from your website to AVVO, as that must be done by the individual client themselves. We prefer that when asking for reviews, you request that clients post to your Google+ Business Page. It is no secret that Google is the defacto search engine, and building reviews with them is one of the best possible places/ways to improve your rankings, both in the regular search and within the local/map listings. How Many Reviews Does My Law Firm Need? As many as possible. In this case, quantity speaks volumes. The more positive reviews you have, the better impression a prospective client will have of your firm. Another benefit to having a large number of positive reviews is that the inevitable bad review will have a much smaller impact on your overall ranking status. For example, on Yelp, if you have only 1 review, and it is a negative, 1-star review, you will need approximately 15 5-star reviews to get back to a 5-star ranking overall. However, if you already have 15 5-star reviews, a single 1-star review will have virtually no impact on your overall star rating. For Google, you will find that you do not get accurate star rankings until you get past 10 reviews, due to the way that they calculate rankings (called the Bayesian Average). So even if you have all 5-star reviews, until you get past 10 total reviews, you will not have an overall 5-star rating. This is because they factor in a margin of error when you are just starting out in an attempt to level the playing field between a business that has 5 glowing reviews and a company that has 45 glowing reviews and one negative. Is the business with only 5 reviews, even though they are all 5-star, better than the one that has 45 5-star and 1 3-star? Probably not. Either way, if you want a 5-star rating with Google, you are going to need to get at least 10 5-star reviews to get there. Can I Legally Use Testimonials on my Lawyer Website? Yes! While there are state specific Bar regulations regarding the use of testimonials or reviews on your Law Firm website, as long as you meet those guidelines, it is perfectly acceptable for you to use these valuable resources as a sales tool. If your law firm resides in a state other than Florida, or you conduct business in a state other than Florida, then the exact regulations may be slightly different. If you have questions about the use of reviews for your specific situation and location, contact us, and we can help to determine the local bar regulations you will need to adhere to. Whatever You Do, Don’t Fake it! The worse thing you can do is try to scam the system. Fake reviews are of no value to anyone. While it seems harmless, it can have negative consequences, ranging from something as simple as having the reviews removed, to major consequences like being disbarred for ethical reasons. 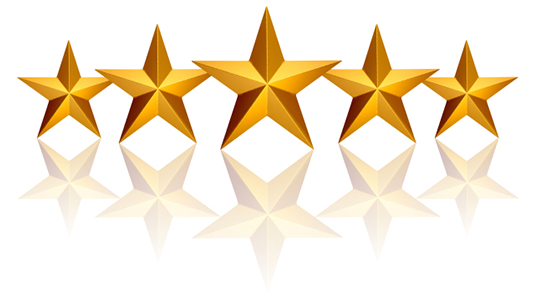 Reviews are intended to be honest representations of an individual’s experience with a business, and fake reviews impact the overall integrity of the review system. If you receive a positive testimonial from a client, reach out and say thank you! Sending them a physical “thank you” card in the mail makes a huge impact, leaves a final positive feeling, and reminds them again of their experience. Maintaining casual, friendly contact through Christmas and Birthday cards also keeps your firm top of mind if they have future needs, or when a friend is looking for a legal reference. As always, we are here to assist you with projecting a trustworthy, professional image to your website visitors. If you have questions, need assistance with generating positive reviews, or simply want to learn more about how Mark My Words Media is helping lawyers succeed online, then give us a call at (877) 721-8491.